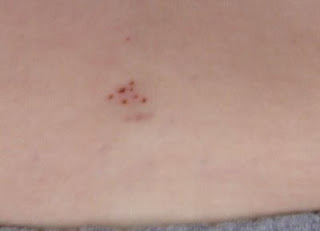 This is what the small of my back looks like a week after EN's birth. The dozen or so punctures are from the various attempts the anesthesiologist made while trying to get the epidural catheter inserted. It took her 30 minutes. In those 30 minutes, I was sitting hunched over, my spine in a 'C', tight against my back. My head down into my chest and shoulders dropped. I wasn't allowed to move at all. And I was having terrible contractions every 2.5 minutes... my aunt was timing them. When she finally got the catheter inserted and the midwife told me to lay down, I told her I was ready to push. She checked me and I was at 8 cm... in half an hour, while sitting in one of THE most uncomfortable positions one could possibly labor in, I went from 2.5 cm dilated to 8 cm dilated and ready to push. Needless to say, I never got any drugs. Ironically, the Sandman writes about having an 'off' day as an anesthesiologist and while I fully respect him and his profession, it might do him and his fellows some good to pause and consider what their 'off' day means to the person they're going to (trying to) treat. 30 minutes and 12 needle sticks. Ouch. Shouldn't have happened. I must say that if I don't reach the epidural space in a couple of tries I don't continue. There is no point in turning the patient into a pin cushion. If possible I call another anesthesiologist to give it a try. There are situations, however, when there is no one else available. Believe me, I know the consequences of complications for my patients. Note that all the women in the post consequently, did have successful epidurals. Oy poor thing. I never had any of those. In my day, there was gas or nothing. OK, not totally true, since my mother had some sort of spinal thing when I was born. But it wasn't as common as today. I hate the idea of something poked in my spine.